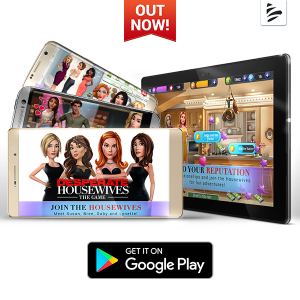 Home » Desperate Housewives: The Game is NOW available for Android devices! ABC and MegaZebra have released the highly anticipated Android version of Desperate Housewives: The Game! MegaZebra is excited to bring Desperate Housewives: The Game to Android. When released on iOS earlier this summer, the game became an instant hit in the vibrant fan community and it was reviewed by popular YouTubers such as NickDominates (115K views) and KPopp (100K views). As of today, Android users will also be able to enjoy one of the most innovative life-simulation games in the market. With the release of the Android version, the game will not only be playable by a much larger audience, but it will also contain some brand-new updates. So far, already 8 episodes have been released of the first season and new exciting features are in the pipeline.